Dampa Wildlife Sanctuary or Dampa Tiger Reserve, the largest wildlife sanctuary, was notified in 1985 and declared a Tiger Reserve in 1994. The Dampa Wildlife Sanctuary is located in the Kolasib district in the state of Mizoram. The sanctuary lies at a distance of about 130kms from Aizawl. The sanctuary covers a wide area of around 550 sq.kms, which is very rich in natural vegetation cover. The sanctuary is an ideal place for all those who want to enjoy the beauties of Mother Nature at its best. The place is quite hilly and is covered with thick forests. The sanctuary is full of hills, jungle streams, deep valleys, ripping rivulets, salt licks etc. The sanctuary abounds in natural vegetation cover and comprises of various rare species of plants & trees. Some of the common species of vegetation found here are Dipterocarpus turbinatus, Terminalia myriocarpa, Dipterocarpus marcocarpus, and various other species of orchids & bamboos. The sanctuary is a home to various animals like Rhesus macaque, Assamese macaque, Giant squirrel, Pigtail macaque, Tiger, Indian Elephant, Himalayan black bear, Leopard, Barking deer, Porcupine, Gaur, Sloth bear, Wild boar and many more. One can also see various types of reptiles like Python, Monitor lizard, Hill Tortoise, King Cobra and many more. Various types of birds are found here that includes both residential as well as migratory birds. Some of the common avifauna seen includes Great Indian hornbill, Emerald dove, Peacock pheasant, Malbar pied hornbill, Crested serpent eagle, Red jungle fowl etc. November to March is the best time to visit the Sanctuary. Temperature ranges from 20°C to 30°C in Summer. Temperature ranges from 10°C to 21°C in Winters. By Air - Aizawl has its own major airport and is well connected to many other cities by domestic flights. The nearest airport is Lengpui Airport of Aizwal. By Rail - The nearest railway station is Silchar Railway Station which is 130 Kms away from the city. 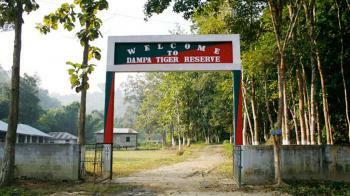 By Road - You can reach Dampa Wildlife Sanctuary easily from Aizwal by road. or by your own vehicle.